Unfashionable though it is in these techno-times, I am a keyboard player. So, I unashamedly offer a keyboard page. Some of my pet keyboard project pages are on the sub-pages. Vintage Vibe has information and parts for Electric Pianos. Both the Wurlitzers and Rhodes are catered for. This is an Estey reed organ. I got given one exactly like this as a child, and kept it until 1995. I must have played a million notes on it. You can see a youtube video of one here that explains how it works. And this was the second keyboard I owned (again this is not a picture of mine - it is long gone). It is a Vox Jaguar - little brother to the famous Continental. For more information about this plucky little combo check out this website. When it comes to keyboard size there is lots of focus on overall length. This is really important, for a keyboard player will need quite a lot of notes. How many? Well, in my experience (which is over 30 years playing) a 4 octave (49 note) is fine for most soloing. The other day I tried out a 2 oct and trying to actually play much on it was just silly (I was checking out the feel because I am interested in a 61 note version with the same action). For any 2 handed playing at least 5 octaves (61 notes) is needed. Now it stands to reason that since a piano has 88 notes (7 1/4 oct) that we should aim for that, but unless your sole goal is to use the keyboard as a piano I would advise against it. Even then, ask yourself "how often do I play the top octave?" If, like me you can live without it; save money, space, and weight, and get a 6 1/4 oct (76 note) or even a 6 oct (73 note) keyboard. The bigger sizes do make sense if you are a one-man-band, as you can have 88 weighted notes so playing piano properly is not a problem, and you have plenty of room on the keys for multi-way splits. In a band (ie one with guitars, bass, drums) I find a 5 oct board is fine for many occassions. It is also small enough to carry easily, and fit on a small stage. The Yahama grand piano and the Hammond organ provide the reference measurements. As you can see there are a variety of key sizes here, on a selection of keyboards that range from inexpensive to expensive. The interesting thing is that some of the cheap ones have better dimensions than the more costly ones. The most important figure is the octave span. The organ is different but only by 1mm so I can get used to that. Some of the synths have a 16.1 cm span which is a full 5mm different to the piano. This is a significant difference, and while with a little practice I can get used to it, there is no way to be swapping between piano and keyboard without hitting a few wrong notes (and any semitone is the worst dischord). This is because we build up 'motor-memory' in our hand muscles. Shorter keys I can live with but it is sneaky and wrong to shorten up the octave span (unless it is a mini keyboard). The other interesting spec is key travel with regard to using Aftertouch. Keyboard 8 has 4mm of extra travel to apply pressure for AT, whereas keyboard 6 has a mere 1mm. This means I have to almost break the key to get any AT effect! Manufacturers never disclose these sizes in the spec sheet, and I think they should, and be making a standard size of key (ie piano size). What keyboard did I buy? Taking my own advice (see below) I decided it was time for a new performance keyboard. What I was after was a 'Swiss Army Knife' that would cater for the various situations I play. These include playing in church, playing in a rock band, playing for a musical production...(hence the need for a versatile instrument). So, top of the list is a wide range of good quality sounds, followed by a good range of controllers for performance. Another factor is weight. My back is not so good, so getting a 25kg keyboard + case was not going to be the answer. Ok, where to start? I could ignore any entry level keyboards, and arranger keyboards (some of which are now quite sophisticated). Also off the list were workstations because I don't need a sequencer, or superb MIDI controller. On these some of the money goes into feature I just don't need. Speaking of money, I started out by considering mid-range keyboards, having set my budget for $2000 to $2500. This seemed like a reasonable amount to spend as I don't play in a band regularly. 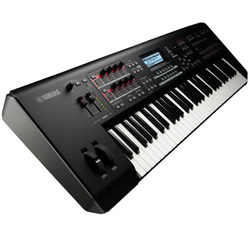 Looking at the possibilities on-line I noticed Yamaha have a new keyboard, the MOX6. This is 61 note, and there is also a MOX8 which is the 88 note version. This presented a problem - I really need a 76 note unweighted keyboard. Anyway, I decided to give the MOX6 a try just in case it is a breakthrough (hey, they did it with the DX7). The local music dealer didn't have any in but was happy to get one in for me to try. After waiting for a week and a half (and organising to review it for NZ Musician magazine) there is still no word. Oh, well. While the MOX6 was supposidly arriving, I checked out the other stores. First up, a play on the Korg M50 (73 note version). Some nice sounds in there, but overall it just didn't feel right - probably because of the lack of real time controls. While there I had a quick play on a Kurzweil PC3x. Again, some great sounds, but I didn't think it a serious contender. Probably the 88 note weighted thing was putting me off (and I was focused on spending no more than $2500). Off to the third shop, where I tried a Roland Juno Gi. Although it is only 61 notes I found it great to play (the D-beam, in Expression Mode helps), and it has a good range of sounds. As expected, the best are Roland synth type ones (fat analogue, E-pianos etc), but it had good pianos, and reasonable strings, and organ. As you can see, along the way I decided to see what else was available at the top end. Roland 's new Jupiter 80 took me by surprise as I was thinking it would be a very capable VA version of the lovely Jupiter 8. As I read about it I realised it is actually more of a stage performance keyboard. It has some really nice control features (eg faders to balance the split/ layered sounds), and switches in front of the keys to switch between performances. It can also switch between programmes without a glitch - nice. Anyway, before I got excited enough to get one to try, I backed off, on the strength of the reviews not giving it a whole-hearted A+. This is Roland's flagship keyboard so for $5500 it really should do everything, and have a lot of X factor. Regarding the sound engine; there is lots of marketing hype, but little to suggest anything really new. At the same price is the Nord Stage 2. Nord synths are great, and the company is not afraid to be Scandinavian and different. This shows up straight away with the bold colour choice. The keyboard is basically a separate piano, organ, and synth controlled from one set of keys. Everything is pretty much right in front of you on the front panel. But...the location/ angle of the pitch wheel is slightly unusual, and the design of the pitchbender is just strange. Ok so far, but here's the thing - although it has some sampled sounds, they don't seem to be a big feature. I'm not even sure if it is possible to edit them. At this point I had to admit defeat - I would be forking out over 5 grand and still have to get a second keyboard. Maybe even a third - and here's why: although the Nord Stage has a synth section it is not as well appointed as any decent analogue (or VA) synth. As an example the Stage 2 has introduced a LFO on the synth. This might be considered good but this is the third model of Nord Stage to be released (Stage, Stage Ex, and now the Stage 2), so I'm not over-wowed. As a comparison, the Kurzweil PC3 can give a sound 32 layers, each having two LFOs (with 44 -yes 44, selectable waveforms). Another thing was the weighted keys - this makes it great for piano but a poor choice for organ and synth. Speaking of Kurzweil, at this point I got to thinking that I should reconsider the PC3LE which was still within reach of my original budget. I had originally discounted it because of its 17kg weight, and my belief that it couldn't really be a synth. By this time I had sorted my 'must have' list: 76 keys (unweighted), good controllabilty, good piano, Rhodes, Wurly, Clav, B3, strings, and synth pads and leads. I went back to the shop and spent over 2 hours on the PC3x and by the end of that time I was convinced. In fact I decided to add a bit to the pot and bought the PC3 instead of the LE. What makes this keyboard great is that it is deep. The programmability is extensive. The keyboard can be split 10 ways and there are 128 voices so the potential is huge. The factory performances (Setups as they are called) give an indication of the power of this synth. It can do huge sounds, but can also do very subtle nuances. What's more, the assignability of the controls is very flexible, and with 9 sliders and various switches there is not much you can't tweak in realtime. Ok, a synth full of knobs looks cooler, but I didn't have any problem getting scorching synth lead breaks going. The PC3 has a separate engine for emulating the B3 / Leslie and it sounds great. The sample playback side has over 1000 sounds so most genres of music can be covered. Some of the Setups make use of the sequencer and/or the arpeggiator, and sound at least as good as anything out of a Korg Workstation. And, it comes with a free sound editor! Oh, and I just had to get the ribbon controller accessory too. As for the weight; at 17kg it is ok because I got a softcase with wheels (now that's progress!). I sometimes get asked what is the best keyboard to buy for gigging. Usually when this question gets asked on an online forum the replies are mostly people suggesting a specific model or two. Here, I will approach it from the point of what purpose is required. Firstly, what size is required? This depends on what sort of keyboard player you are. A piano has 88 notes, but for the vast amount of music the extremities are not needed so even for solo piano a 76 note keyboard will suit most people. In a lot of bands the keyboard player has little or no 'piano' to play and doesn't solo much either. In this case 61 note keyboards are ideal as they help you restrict your playing to what suits the band (often just one handed). A slight downside is not the number of keys per se but that almost all 61 note keyboards are from notes C to C. This places the note F at the middle of the keyboard, with middle C a bit to the left (whereas middle C is at the middle of a piano keyboard). At the opposite end of the spectrum to an 88 note keyboard are the short ones used by non-keyboardists. These will have very short keyboards, and lots of controllers. Related to size is the weight of the keyboard - 88 note ones require two people to move them (some modern ones are much lighter, but a lot less durable). They are also quite large, don't get an 88 if you drive a mini, or play on a tiny stage. Secondly, what sort of action do you want. For an authentic piano experience weighted wooden keys are best, but even if you've decided to allow for the size, weight and expense they are not necessarily the best choice overall. 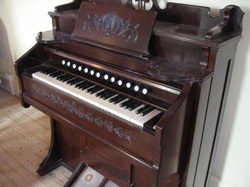 For playing B3 organ for example a lighter keyboard with sprung plastic keys is more like the real thing. For playing non-keyboard sounds (eg trumpet, strings, brass, synth-bass, synth-lead) a lightweight keyboard is needed to get the speed required to play with the articulation of those instruments. OTOH, more controlled expression is possible on a weighted keyboard. Nowadays some keyboards have a 'semi-weighted' action, which is a good compromise if you will be playing all sorts of things. Many keyboards also feature some adjustments to the keyboard sensitivity. This may be simply choosing soft/med/hard, or on more professional models allowing you to select from a large variety of velocity scalings. The point is to get the keys to respond in a way you are used to (especially important if you are changing between a keyboard and piano a lot). Thirdly, what type of sounds are you going to be making? The sounds of a 70s pop song are quite different to those needed for Dubstep. Not many keyboards do an excellent job of creating all musical sounds, and those that do are the expensive ones. Work out your sound priorities. If a really good range of synth tones are required then look at the models that specialise in that area. Also, if that is the case, you will probably want some good real-time controllers for filter-sweeps etc. Analogue synthesisers (or digital emulations of analogue) do this best. OTOH, if you need good 'natural' sounds (such as flutes, banjos, and trumpets), sampling technology will sound most convincing. Don't be tricked by the huge number of sounds some keyboards have - many will be of no use. If you must have a really good B3 sound and a great Rhodes sound, make sure it has those (and hopefully several variations). Also don't get trapped by thinking you will programme the thing to get missing sounds. Even if you have the time and determination, not every sound can be got from a particular synthesiser. Finally, think about controllers - pianists will need a good sustain pedal, organists a good volume pedal (I recommend both). Pitch wheel, modulation wheel, and velocity sensing keys are all important. Not so much; aftertouch. At least one MIDI out port is important (that way you can connect additional sounds to the keyboard of your choice. So, this advice is just to get you thinking, now it's time to go to the music store to try the touch, and listen to the sounds. This website has some more information on keyboard types. 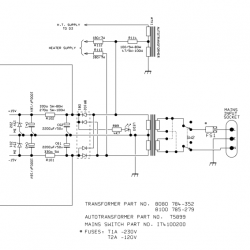 What makes a good keyboard amplifer? Keyboard amps tend to be a bit misunderstood (a lot like Keyboard players!). Probably the easiest way to identify what is needed for a keyboard amp is to compare it with a guitar amp. Keyboardists tend to have more than one instrument at a gig and they need to be plugged in and ready to go. This means more than one input is needed, along with separate level controls so that the front end acts as a mixer as well as a preamp. Another main difference is that keyboards are stereo and will be DId into the PA, so the keyboard amp is just used for the musicians foldback. Keyboards can produce bass so a 15" woofer is needed, whereas guitars (with a low note of 84 hz) suit 12" drivers. Back in the days there were no special keyboard amps. 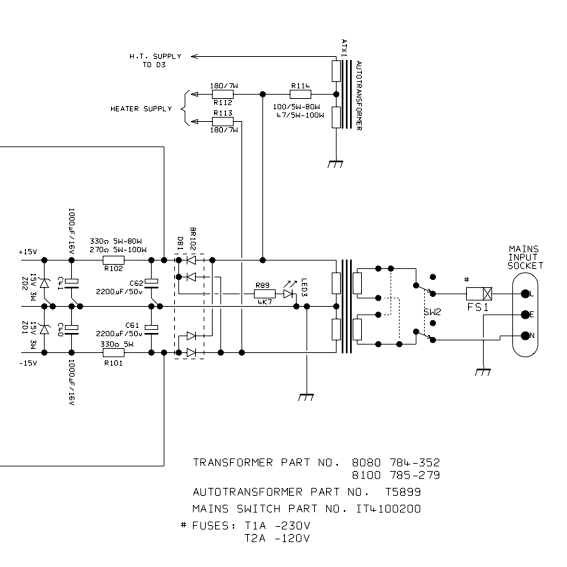 Guitar amps could be used but lacked extra inputs, and a flat frequency response. As well as this the clean channel on most guitar amps is ...not. For years, I used a grunty little TEAC hifi amp with a couple of 2 x 12" speaker cabinets (my own design), but as I got older something lighter seemed more appropriate. So I got a Marshall Valvestate 8080 that needed a bit of work. Like most of these it had fallen forward onto the floor a few times. Because the front panel controls are not recessed quite enough, this damages the pots and they turn noisy or stop working. I replaced them all, and while I had the thing apart took a look at the power supply. Marshall have made some good amps, but this is not one of them and the cheap power supply is largely to blame. The filtering capacitors are too small so I changed the 2200µF size for 4700µF (these are the ones that supply the power amp), and the 1000µF size for 2200µF (these supply the preamp). I also uprated the burnt-looking 330Ω resistors to 5W, and the 15V Zener diodes to 5W. This makes the amp more reliable and as it has some reserve power in the larger capacitors it sounds much better too. Finally, I did some frequency sweeps and found that an almost flat response can be obtained with a little experimentation with the tone controls. How 'flat' are those tone controls? first, here is the loopback ƒ response through a Saffire interface. As you can see it is ruler straight. On the 8080 the test circuit is from input to line out, on the KB100 from the input to the preamp out, so any variation is in the tone controls. 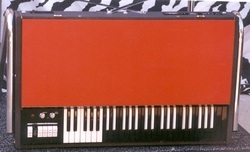 The KB100 has four tone controls, named bass, low mid, high mid, and treble. Here is the ƒ response when they are all set to 0. You can see it is slightly bass heavy and treble light. This is the best case result for getting it flat. The bass is cut by 3dB, and the treble boosted by 3dB. no change to the mid controls. Bass boost. The manual quotes ±15dB at 80 Hz. The boost amount seems a it less, but the frequency is spot on. Bass cut. Yep, it's doing the right thing, although it looks more like ±10dB to me. Low mid cut. Notice the behaviour of this band is independent of other frequencies. A Baxandell design (with feedback) must be used to prevent interaction. High Mid boost.Slightly south of the 2kHz stated in the manual. Hi Mid cut. Again, it is 'good behaviour'. Treble boost. According to the manual, the cutoff frequency for the high EQ is 8kHz. The test agrees with that. So, to summarise, the KB100 is almost flat with all the tone controls set to mid-position. It has a slight tip towards the bass end, but is pretty flat, and this is easily corrected with the 3dB bass cut and 3dB treble boost. Furthermore, the controls work as expected, independently and at the specified frequencies, albeit offering more like ±10dB. Now for the Marshall 8080. Being a guitar amp, this has more settings. There is a clean channel (named Normal), with a "Crunch" switch, and a distorted channel (named Boost), with an Overdrive switch. Here is the front panel layout, showing the 3 EQ bands on each channel. The distorted side also has a Contour control that sweeps the mid frequency. Normal channel with tone controls set flat. Normal Channel with added 'Crunch'. This boosts the mids and cuts the highs. For the following tests I switched the Crunch off, so I could best see the variation from "flat" as each band was adjusted. Normal Channel with bass boost. As you can see the maximum boost is actually only about +3dB. Normal Channel with bass cut. Normal channel with mid boost. Again, this is not a very substantial amount. Normal channel with mid cut. Now we know that the mid ƒ is about 750Hz. Normal channel with treble boost. Normal channel with treble cut. Boost channel set to flat, with the OD switch out. Boost channel set to flat, with the OD switch in. Boost channel with bass boost. Boost channel with bass cut. Boost channel with mid boost. Boost channel with mid cut. Boost channel with treble boost. Boost channel with treble cut. Boost channel with contour at maximum. Boost channel with contour at minimum. Summary for the Marshall 8080. The graphs show that the basic ƒ flatness of the normal channel is fairly good. It can be improved a little by altering the tone controls. The other things that become apparent with these sweeps is that boosts and cuts are not equal, and this is particularly noticeable with the mid controls, where boosts are not very impressive. This is not a fault, as the guitar and the speaker are both acting like a BPF, so huge mid boosts are not required. The tone controls are marked from 0 to 10, so there is no particular reason why a 12 o'clock setting is flat (or even half way between full boost and cut. Indeed, the manual offers no actual specifications for EQ, but states " the only way to really get to know their full range is to play with them." The contour control sweeps from the mids (900Hz) up to the high frequencies, and interestingly is wired so that the maximum position selects the lowest frequency. As we move to the Boost channel the midway settings on the tone controls becomes increasingly meaningless. It is simply a matter of adjust to taste.